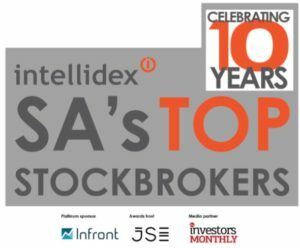 Intellidex conducted the inaugural Top Stockbroker of the Year awards in 2010 and it has since established itself as the industry’s premier rankings. In 2018 the four firms winning the major awards made an interesting contrast. Standard Online Share Trading/Stockbroking was the Top Stockbroker of the Year, having won it for three years in a row. Afrifocus Securities was ranked the Top Advice-Based Stockbroker and EasyEquities was the Top Online trader. DWT Securities took the People’s Choice award, which is prized highly because it is determined solely by client feedback. The other awards were based on an assessment by Intellidex, which was strongly informed by client views. The structure and nature of the survey have been informed by the experience Intellidex has built up over the years of running the survey as well feedback from the stockbroking community and stockbroking clients. In 2015 the survey format changed substantially with more emphasis placed on specific offerings to clients and client satisfaction ratings, and less emphasis on how stockbrokers would cater to different client archetypes. We subsequently changed the awards to recognise the top online broker and the top advice-based (telephone) broker. The research follows three legs. First, a comprehensive questionnaire is sent to stockbrokers, asking for details of their products, pricing and market positioning. Second, a mystery shopping and desktop research exercise is undertaken by Intellidex analysts to verify information provided and assess transparency and responsiveness. Finally, a major online survey is undertaken of retail stockbroking clients. An in-depth analysis of the results is undertaken, allocating scores to each stockbroker’s performance in various categories based on the information provided, our own assessments and feedback from the client survey. The point weightings are generally guided by the range in the market, so for example when calculating value for money the cheapest broker is scored 5/5 and the most expensive is scored 1/5. Points are awarded proportionately to the brokers between these extremes. The 2018 survey report can be downloaded here. The 2019 Top Stockbrokers will be published on 26 September in Financial Mail Investors Monthly with InFront as the Platinum Sponsors.